Over the years the temporary fence and construction business has been booming with new opportunities. The most common reason for the increase in business is the implementation of city and county codes requiring temporary fence around construction sites in the limits of the city or the county. Most of this legislation has come about in efforts to keep children safe. In past decades, a temporary fence was constructed to keep unwanted intruders and thieves out of particular job site areas and that is still true on a broad scope. 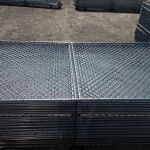 Southwestern Wire Inc fabricates many sizes and styles for temporary construction panels for use in event management, building construction, crowd control, oil and natural gas production, security and many other industries. The most common height of panel is 6′ tall but 4′ and 8′ tall panels can be manufactured at our facility. Barbed wire can also be added to panel heights as needed. The most common length is 12′ with 10′, 14′, 16′, 21′ and 24′ panels also available. Pipe diameters used are numerous and construction methods can be tailored to the client need. Panels can be manufactured in use with a “temporary stand” or with “rings” to allow a post to be driven through the ring into the ground below. As with all Southwestern Wire manufactured products you should come to expect the best quality in construction and the best service in delivery as with any products from Southwestern Wire. Please contact your local sales representative for fence repair in Louisville, KY and construction options and pricing on truckloads.